The EZ Greenhouse, with its simplistic structure and generous internal space, is conducive for any gardening project. 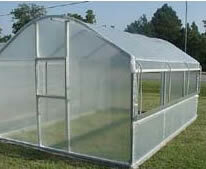 The EZ greenhouse features a strong frame of galvanized 1.660 round tubing with interchangeable parts. It is extremely simple to install with basic tools and minimal effort. The cover rolls up to help ventilate the greenhouse but doesn't not make it rough weather ready so keep this in mind when considering a purchase.